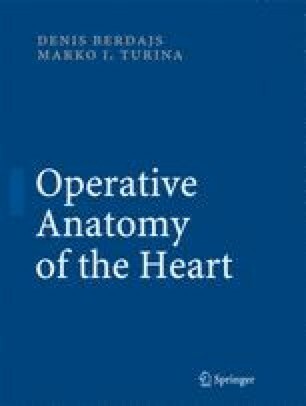 In this chapter, we will discuss the anatomy of the tricuspid valve. As with the mitral valve, we will begin the structural anatomy of the papillary muscles. The anterior wall of the right ventricle must be removed to expose the outflow tract of the right ventricle (Fig. 8.1). The trabeculae of the sinus segment were dissected to reveal their attachment to the musculature of the right ventricle. The superior papillary (Lancisi) muscle is located beneath the inferior border of the posterior wall of the infundibulum. The line between the nadir of the left pulmonary leaflet and the superior papillary muscle demarcates the parietal and septal bands. This distance may vary, in the highly positioned infundibulum even reaching 2 cm; in the short infundibulum, this distance is shorter. The posterior wall of the infundibulum and its relationship to the superior papillary muscle is clearly visible on Fig. 8.2, in which the anterior and right leaflets of the pulmonary valve have been removed. The left cusp of the pulmonary valve lies straight over the posterior wall of the infundibulum. The parietal band projects over the anterior commissure and the anterior leaflet of the tricuspid leaflet.